If it is true, I have schizophrenia for longtime ago. I started to become the poet at fifteen, the poetry translator at eighteen, the art critic at twenty-five. And it continues until the end of my life. Some of them has been published, some others are still in the secret. Between my publication, two are in poetry, two are in poet translation, and two more (still in progress) are in art critic. Tang Dynasty Poetry - Poet's Conversation, Vietnamese Culture and Art Publishing House, Ho Chi Minh City, Vietnam, 2013. Poetical Diary, Vietnamese Culture and Art Publishing House, Ho Chi Minh City, Vietnam, 2015. 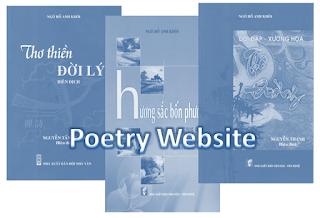 Zen Poetry In Ly Dynasty (Poetry Translation), Vietnam Writers' Association Publishing House, Ha Noi, Vietnam, 2013. Spring Perfume And Beauty, Vietnamese Culture and Art Publishing House, Ho Chi Minh City, Vietnam, 2013. I participated also in some culture activities as World Poetry Festival ("Festival des Poésies du Monde"), in 2013, 2014 in Tours, France and 2016 in Lyon, France. Here is a video which present my work in the festival in 2016.